Have you ever started out to do one thing only to find yourself doing something altogether different? 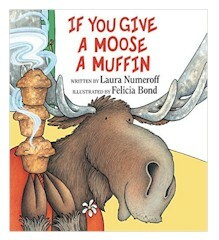 Anyway, according to the book, if you give a moose a muffin he’ll want another…and another. That’s the idea behind the Muffin Project. All sorts of studies have been done* and are being done about how important it is for students to be competent readers by the end of third grade. To help just a little with that goal, I’m going to give a copy of The Clue at Copper Harbor to all the third graders I visit during this school year. (And no, it doesn’t have anything to do with the fact that there is a VERY cute moose in my book too. Oops, procrastinating again…sorry!) My first visit is to Flint, Michigan at the end of September and I’m very excited. * Start with “Early Warning: Why Reading by the End of Third Grade Matters,” a report issued by the Annie E. Casey Foundation.